Some may say that a nuclear agreement could soon be signed in Vienna between Iran and the world powers. But that isn't the point. The point is that even after a final deal is struck, Washington will continue its hostility toward Iran. The warmongers will continue wreaking havoc across the Middle East and North Africa – and for reasons that have little or nothing to do with Iran or its nuclear program. That is why Supreme Leader Ayatollah Seyyed Ali Khamenei says the struggle against the arrogant powers will continue – even after a deal. -- With great impunity and no accountability to international law, the United States and its Arab-Israeli allies remain busy destroying sovereign nations, all because they have rejected foreign meddling and said yes to democracy and self-determination. --Thanks to the U.S.-led wars of terror and aggression, hundreds of thousands of innocent civilians have been killed and continue to die in places like Iraq, Syria, Yemen, Libya and Afghanistan. Most tragic is the fact that the United Nations is doing nothing about it: No resolutions, no condemnations, no sanctions and certainly no charges at the International Criminal Court in The Hague have been lodged against the war criminals responsible. -- While the world hangs its head in shame, the apartheid, occupation, land theft, war and crimes against humanity of the U.S.-backed Zionist regime of Israel continue to destroy Palestinian lives. --The medieval butchers of America’s very own creation Daesh as well as al-Qaeda and other terrorist affiliates continue their reign of terror across our volatile region. Meanwhile, the U.S.-led anti-Daesh circus continues to "entertain" the world, creating even more violence and misery. --Millions of refugees continue to suffer under the harshest conditions across our region and beyond, all because of the military adventurism of the United States and its Israeli-Arab allies. These arrogant entities are desperate to preserve the status quo - even if it means the destruction of all sovereign nations and communities. These are just a few of the reasons Leader of the Islamic Revolution Ayatollah Khamenei insists that the nuclear talks must never include the discussion of regional issues with American diplomats. There is a reason the bullying powers remain hostile toward Iran: It refuses to accept their arrogant system. On Saturday, Ayatollah Seyyed Ali Khamenei told a meeting of Tehran students that the United States is the "ultimate embodiment of global arrogance." His eminence met Saturday afternoon with 1,000 students from across the country. Speaking at the meeting, he described the battle against global arrogance as an ideal for the students, stressing: "The central reason for the enmity of the global bullies toward the people of Iran is the Islamic Republic's rejection of a system based on oppressor and oppressed." Referring to the methods Marxist and communist groups use to impose their ideas on others, the Supreme Leader said: "If news about a return of the Marxist orientation to some of our universities is true, we can be sure that U.S. money is behind it and that their goal is to separate and disintegrate the bonds between our students." 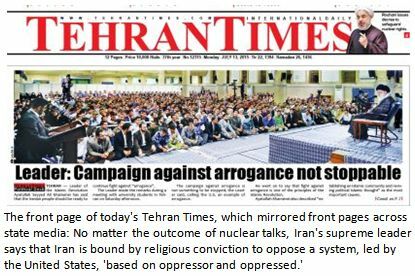 When asked whether students should continue fighting the arrogance after the nuclear negotiations, the Supreme Leader answered: "Based on Quranic principles, fighting the arrogance and global imperialism is never-ending, and that today, America is the very epitome of that arrogance." Ayatollah Khamenei said, "Fighting global arrogance is the core of our revolution and we cannot put it on hold. Prepare to continue your fight against the global arrogance." Iran, the United States and other major powers are struggling to break a deadlock which has held up a historic deal that would bring sanctions relief to Tehran. Tehran and the six powers have given themselves until today [Monday] to reach an agreement, after their third extension in two weeks. The Iranian delegation accuses the West of throwing up new stumbling blocks. 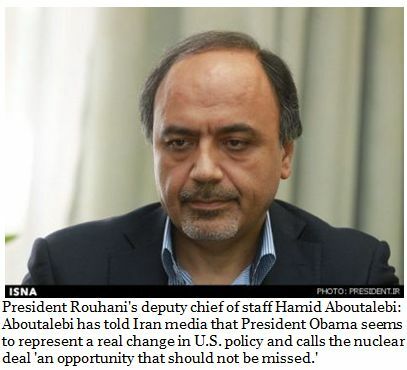 "We have told our negotiating officials that they should only negotiate on the nuclear issue. Although the American side raises regional issues such as Syria and Yemen, our officials have told them that we will not negotiate over these issues. Fighting the arrogance is a principle of the Revolution. It is a fundamental task. Therefore, you should prepare yourselves to continue the battle." Ayatollah Khamenei added that the campaign against arrogance, based on Quranic principles, will never be ended. The Leader pointed to Iran’s "astonishing and spiritual presence and influence” in the region, which have incurred the wrath of the Saudi aggressors. His Eminence stated that the reason the Saudis and their supporters have bombarded the houses of Yemeni people is the rage and anger they feel toward Iran's influence in the region. He reiterated that "Despite their claims to the contrary, Islamic Iran's influence in the region springs from a divine blessing, not from physical force or the power of weapons. Like [late Iranian jurist] Shahid Beheshti, we would like to say to enemies of the people, 'Go and die of your rage and anger.'" The Leader said Saudi Arabia and its allies have been brutally pounding Yemen, killing the innocent and oppressed Yemeni people for over 100 days mainly due to Iran’s regional influence. Ayatollah Khamenei added that in covert talks among themselves, the U.S. and the reactionary states of the region admit to Iran’s regional influence, but can do nothing about it.